International Business Park at Concord is located in the heart of a dynamic region that is experiencing a fast pace of growth. According to a recent WalletHub study, Concord ranks as the ninth overall fastest-growing city and the third fastest-growing small city in the U.S.
WalletHub analysts compared 515 U.S. cities on 14 factors of rapid economic growth from 2009 to 2015. Factors included population growth, unemployment rate decreases, job growth, growth in regional GDP per capita and business number growth. The study helps emphasize International Business Park’s tremendous and lucrative opportunities for the service, retail, office and hospitality industries. While small clusters of restaurants and shops can be found within a few minutes, there is a major unmet need for shopping, dining and hospitality options at Exit 55 – one of the busiest interchanges in the state. Additionally, there are 3,100 people employed at the 30 companies located within in the IBP, including Fortune 500 corporations and numerous international companies that often bring out-of-town guests to the park. Learn more about Phase III. Phase III of the IBP offers nearly 50 acres of prime mixed-use land situated just off the intersection of I-85 and Highway 73. Around 90,000 vehicles are estimated to pass by Exit 55 every day, with more than 25,000 passing IBP on Highway 73 alone. 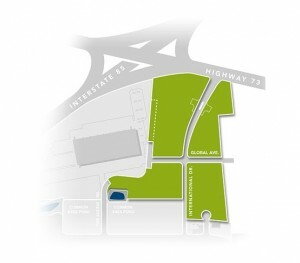 Just under 17 acres in size, Lot A is well-suited for commercial retail development and has out parcels available. Lot B features nearly 11 acres of land that can be divided for various commercial and office development needs. Lot C offers 13 acres of mixed-use land that’s ideal for hotel development. Lot D is a prime location for office development and features 8 acres of mixed-use space that can be divided to suit any needs. The advantages for hotel and retail development at the IBP go beyond its desirable location. It is also within 10 miles of several major attractions, including Charlotte Motor Speedway, PNC Music Pavilion, North Carolina Research Campus, Concord Regional Airport and Concord Mills shopping center. Charlotte-Douglas International Airport and uptown Charlotte are located only about 25 minutes from the IBP. To learn more about hotel, retail and office opportunities at the International Business Park at Concord, contact Anne Johnson or Bryan Crutcher with the Charlotte office of CBRE. Situated at one of the busiest interchanges in North Carolina (I-85 and NC 73), Phase III of the International Business Park is ideal for hotel and retail development. Nearly 50 acres of prime mixed use land are available in Phase III. Explore the space in our interactive site plan below. Hover over sites for acreage and potential uses. Phase III sites can be divided.